It's the middle of September, and across some of the country it's getting cooler. That means it's the perfect time for a bowl of soup! I've been a fan of Italian food for quite some time, and when it comes to making homemade soup the simple goodness of fresh vegetables can't be beat! 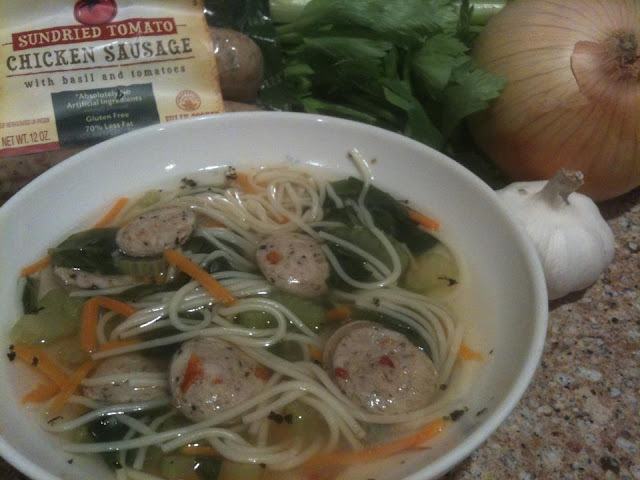 Al Fresco all natural chicken sausages is a coordinating Allrecipes sponsor this month, and I chose to spotlight their sun-dried tomato chicken sausage in my soup. Presenting Italian Wedding soup al Fresco style. This soup is delightfully simple to prepare, and doesn't require that much time to make at all! In a large saucepan over medium high heat add the chicken broth. Cover and Allow to come to a gentle boil. Add the angel hair pasta, celery, carrots, and fresh spinach. Stir to combine. Allow to simmer uncovered until the pasta is tender. Add in the garlic clove, black pepper, basil, and sliced sausage links. Cook for another 5 minutes. Simple huh? Oh and the taste! Fresh, and light! Even better for those who are on the points plus program - the ENTIRE batch of soup calculates out to 12 points, and based on serving sizes would be about 2-3 points per serving...NOT bad at all!